If there’s one pest that gardeners hate more than any other, it’s slugs and snails. After weeks of carefully raising small plants from seed, checking their moisture levels and gradually hardening them off outside, these slimy beasts can wreck it all. In years gone by the standard answer was slug pellets, but these are poisons that can cause considerable distress for pets, wildlife and birds. They usually contain metaldehyde, which is a pesticide, and isn’t in keeping with organic principles. More recently, products can contain ferric sulphate or ferris phosphate, which is relatively non-toxic to vertebrate animals and is often sold as suitable for organic gardening, but there are many other ways to beat slugs and snails that don’t use any chemicals. The barrier method works by creating a physical barrier between the slugs and snails and your precious plants, with some twists for added effect. A dry, gritty substance such as crushed eggshells, wood ash, sand, or a commercially purchased product can be placed around particularly vulnerable crops. The dryness is a deterrent, as slugs and snails like wet conditions. However these will need to be replenished after periods of wet weather. A ring of copper around your plants or pots gives them a slight electric shock, and could deter them from scaling your pots. Plastic barriers are commercially available, or placing seedlings and crops up high can make it that little bit more difficult for them to reach, so outdoor shelving or raising pots up off the ground can all help. Make sure there is no foliage bridging the gap, as you can guarantee slugs will find it and bypass your defences. Slugs love beer, milk, and most sugary and yeasty liquids, and are attracted by the smell. It’s easy to make a beer trap – just sink a shallow pot, like an old yogurt pot, into the ground at the edge of your crops, and fill with beer. The slugs will be attracted to the trap, sup the beer, and drown. You’ll need to replenish the beer and empty the slug soup on a regular basis. You can also place empty upturned grapefruit, orange, melon or coconut shells in your garden. Leave them overnight and check them in the morning, where you’ll find slugs have gathered. You can then pick them off and compost the waste fruit skins. Slugs are most active in wet, humid weather, and especially so at night, so a nocturnal trip to the vegetable plot with your torch can deliver rich, slimy pickings. Check under and around vulnerable plants like salads and squashes, under stones and around the edges of pots, particularly at the back out of sight. Put them in a sealed container until morning. They can then be fed to birds or chickens, or be killed and disposed of. Slugs always go for tender seedlings in preference to established plants, so it’s a good idea to raised plants to a healthy size in a slug-free area such as a greenhouse before planting them out in their final positions. This can be coupled with providing some young foliage or seedlings for the slugs to eat in preference. It’s a great idea to raise spare plants, so if some do get munched you can pop a replacement straight in its place. Microscopic parasitic worms called nematodes can be purchased from garden centres or are available via mail order. They are mixed with water and applied to the soil with a watering can. Moist, warm soil is best, usually in the early evening. The nematodes enter the slug’s body and infect them with a bacterium that causes a fatal disease, usually within about two weeks. It’s widely used in organic agriculture, but it’s not effective against snails. 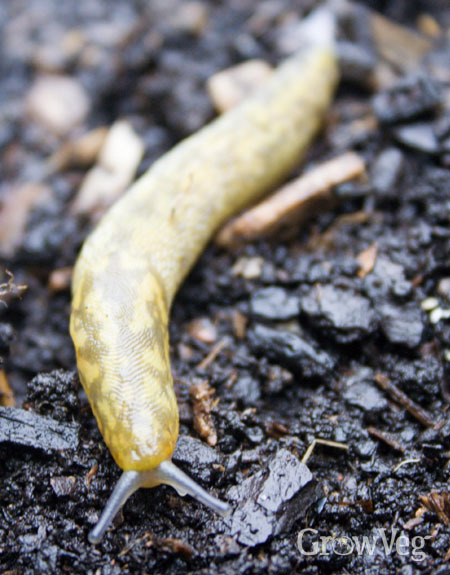 Attracting frogs, toads, hedgehogs, ground beetles and some birds to your garden can help keep slugs under control, as they are a natural food source for these animals, so having a pond or creating other suitable habitat in your garden can all help. Slugs and snails love damp, dark patches where they can hide during the day, so keep a tidy plot around your vegetables can help to keep their numbers down. Rake up and compost leaves to reduce the number of hiding places, and rake over soil in spring and autumn to expose their eggs – little groups of creamy white spheres that will be eaten by birds or can be squashed by hand. And make sure pots are cleaned and stored in a dry place, as slugs and snails love hiding amongst them. Slugs and snails are part of the life of any gardener, and it’s unlikely the battle will ever be won, but by combining some of these methods – and with a little patience – you can ensure you get a bumper crop with minimal damages from these slimy creatures. "Wood ashes, rock salt (surprisingly good results) "
"I am a novice gardener and have lost so many precious seedlings to snails and slugs. I go out at night with a flashlight and pick them off manually but even my seedlings in the greenhouse, which are up on shelves, are still eaten. Beer traps, coffee grounds and cornmeal (maize) traps are helping but I detest the slimy pests!" "I buy cheap copper scrubbing rolls at the dollar store and stretch them and put them around my hostas. Usually they are 3 /$1. They do rust over the summer but do a good job of deterring the slugs."